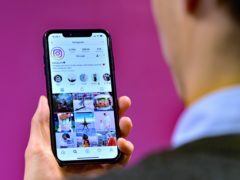 Well, such is the way with these high-performance machines, Toyota is aiming to capitalise on that success with a more pedestrian model that takes some inspiration from the hot hatch. This such a car — the Yaris GR Sport. Can it make waves in the sporty-ish hatch segment in the same way its full-blown sibling did in the heavyweight class? While the Yaris GRMN was a ‘skunkworks’ project that required a whole reworking of the hatch’s underpinnings and tons of development time to perfect, the GR Sport is quite a lot more conventional. What you’re looking at here is effectively a Yaris Hybrid with some go faster bits. Take a glance at it, and you may notice the addition of black-painted trim pieces, GR badging and lower ride height to give it that all-important racy look. What you probably won’t pick up immediately is the Sachs dampers lifted from the GRMN, as well as Bridgestone Potenza RE50 rubber also sourced from the hot hatch. 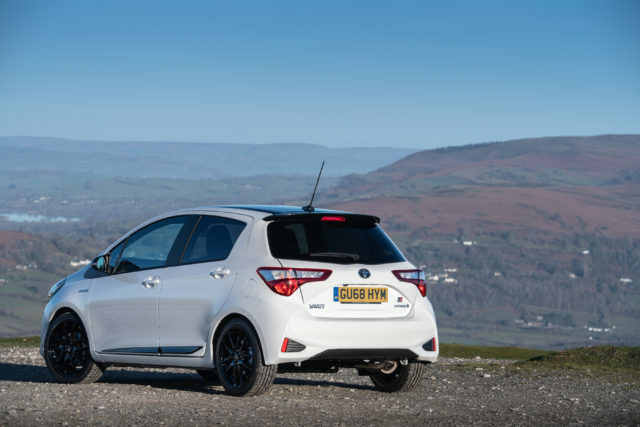 As mentioned, this is effectively a racy-looking Yaris Hybrid — meaning it’s powered by a four-cylinder naturally-aspirated petrol engine paired up to an electric motor to produce 98bhp and 125Nm of torque. With that sent to the front wheels via a CVT, 0-60mph comes in 11.6 seconds while a top speed of 103mph is possible. 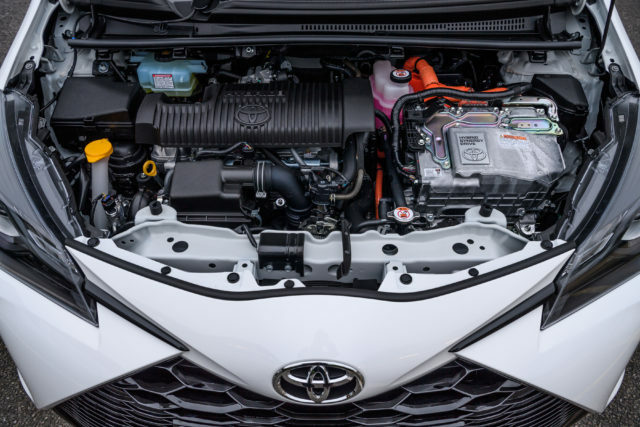 When it comes to efficiency, Toyota claims the car can achieve 56-60.1mpg on the combined cycle while emitting 89g/km of CO2. 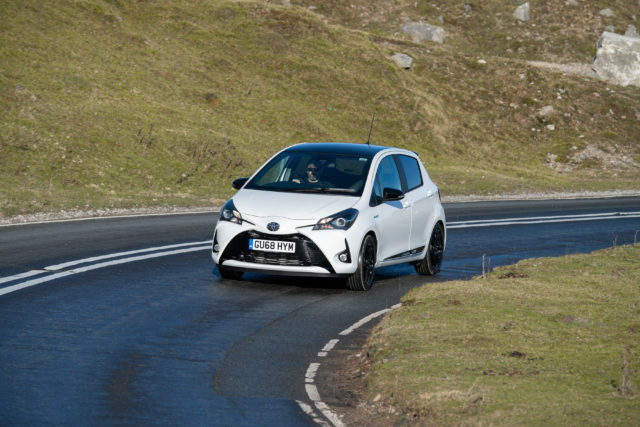 Toyota has made a real effort with the chassis to try and upgrade the driving dynamics of the Yaris Hybrid, here introducing Sachs Performance suspension found on the GRMN as well as an anti-roll bar for increased stiffness, while also wrapping its 17-inch alloy wheels in sticky Bridgestone Potenza RE50 tyres. The effects are certainly noticeable. The car inspires confidence when driven harder, and there’s far more grip than you could ever really need — which in itself highlights the main issue of the GR Sport; the powertrain-chassis mismatch. It leaves a sense that a more potent and characterful engine would’ve really made this an exceptionally fun car, or that sticking with the GR appearance and not bothering with the racy mechanical upgrades would’ve resulted in a perfectly fine, nice-looking thing. As it stands, it’s just a very firm car sitting in a weird middle ground. The attempts to make this look racier are worthwhile, though. New to the car are a number of black-painted, model-specific highlights, 17-inch black alloy wheels and an 11mm ride height which gives it a more aggressive stance. There’s also the option of red decals (£100) that our test car sadly did without. 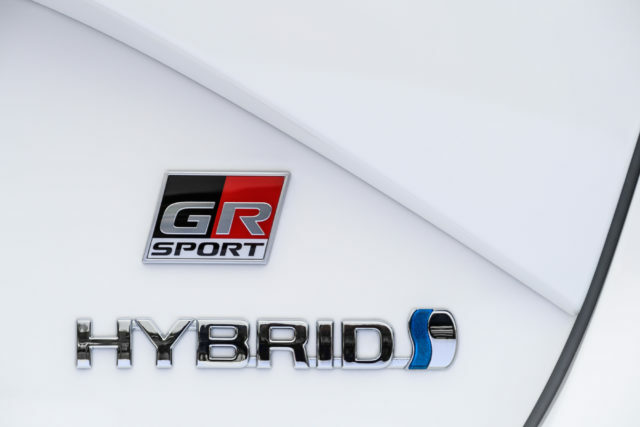 While inside the GR Sport is not a far cry from the rest of the hybrid’s range, there are a number of introductions to mark it out against the rest of the line-up. Front occupants will find themselves hugged tight by Ultrasuede-upholstered semi-bucket seats which provide good levels of comfort, while the driver is sat in front of a steering wheel borrowed from the GT86 — much like the GRMN, albeit with the exclusion of the red 12 o’clock stripe as seen in the full-whack car. Switch the car on, and the TFT display in the gauge cluster will also throw up a little GR animation. Those additions aside, it’s all very much standard Yaris Hybrid. 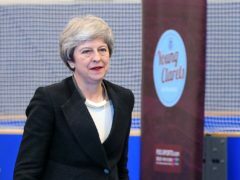 That means seating for five — though don’t expect adults to be comfortable in the back — along with a generous 286 litre boot, and plenty of hard plastics used throughout the cabin. 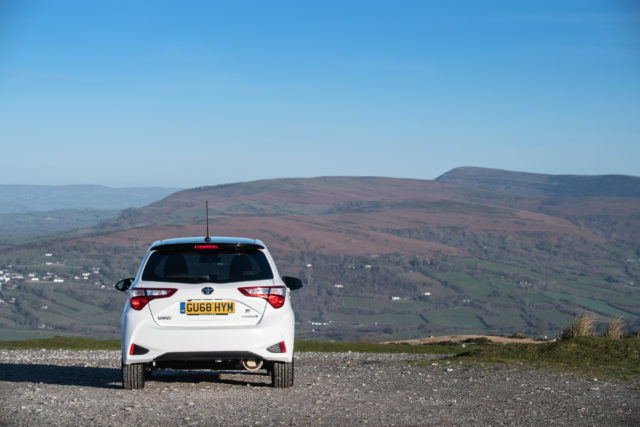 Positioned at the top of the regular Toyota Yaris range, the GR Sport comes with a generous helping of equipment. 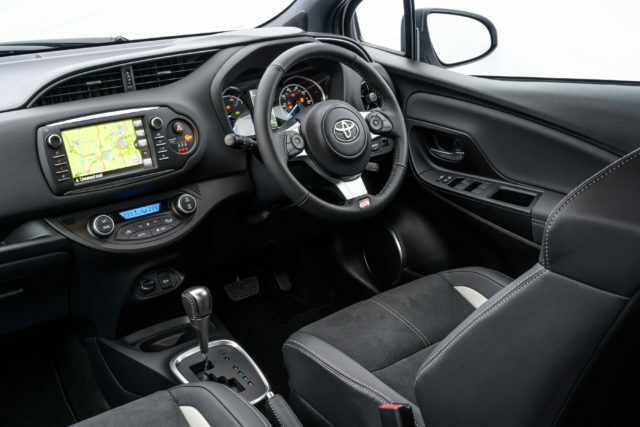 As well as all the racier chassis and visual additions, it features cruise control, rain-sensing wipers, a rear-view camera, front parking sensors and Toyota’s Touch 2 infotainment system. There’s also a decent helping of safety equipment — with pre-collision assist, lane departure warning, automatic high beam and road sign recognition all included at no extra cost. While that may look a respectable amount of kit, it still makes the price of the car hard to justify — the GR Sport starts at £19,835. That’s about the same starting price as a Ford Fiesta ST — a proper hot hatch — and more than £1,000 over the list price of a more engaging and better equipped Suzuki Swift Sport. Further still, the GRMN itself can still be picked up from dealers for as little as around £23,000 with delivery miles – which is a more tempting upgrade if you take monthly payments into account. We like — nay, adore — the idea of a baby Yaris GRMN. That car is astonishing, and a cheaper version that could capture some of its hot-hatch spirit while being more useable would be an appealing prospect. 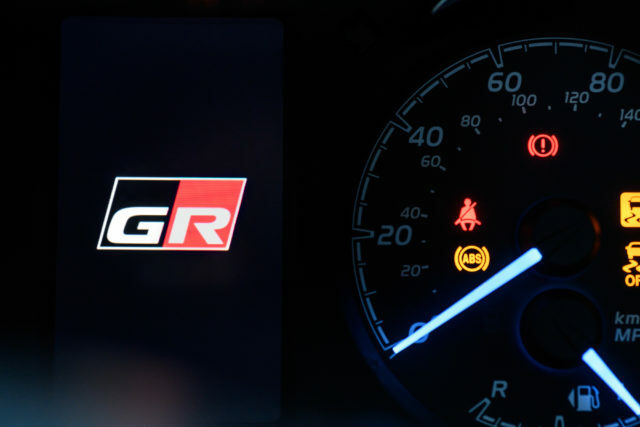 The GR Sport is not that car though. While the chassis has the potential to deliver on fun, it’s let down by a powertrain that never really feels at home when being pushed. And when you do drive it with efficiency in mind, the racier enhancements just comprise on the car’s comfort too much. There’s a lot left to be desired from the GR Sport, and hopefully that’s a gap Toyota will choose to fill.